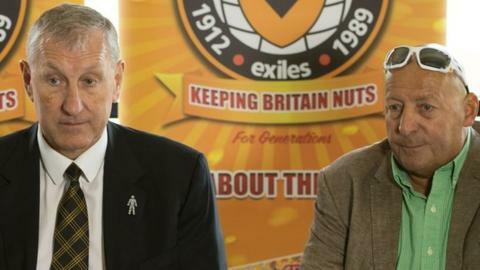 Newport County chairman Les Scadding says new manager Terry Butcher will have less money at his disposal than predecessor Justin Edinburgh. Scadding says former England star Butcher "knows what the budget is". Asked by BBC Radio Wales Sport if Butcher's cash resources for players would be as big as Edinburgh's Scadding replied: "No." The League Two club's chairman added: "If he's [Butcher] happy, we're happy. He can work with that budget." Butcher is expected to make his former Ipswich and England defensive partner Russell Osman his assistant. He will also need to rebuild the squad with just four first-team players: goalkeeper Joe Day, defender Kevin Feely and midfielders Mark Byrne and Yan Klukowski under contract. Jimmy Dack took over as caretaker when former manager Edinburgh left for Gillingham in February and led County to a ninth placed finish in League Two in 2014-15. They finished 14th the previous season in their first term back in the Football League and Scadding hopes the club can continue to progress. "This club needs to be financially, a little bit more, standing on its own two feet and it's not going to do that if it's going to need excess budgets that really don't perform with the team," he said. "There is a budget and it is to be kept to and hopefully it will be enough budget to carry on as we are going."